We awoke in Quilotoa, a quaint mountain town at the base of what was once a towering volcano, now a breathtaking crater-lake. 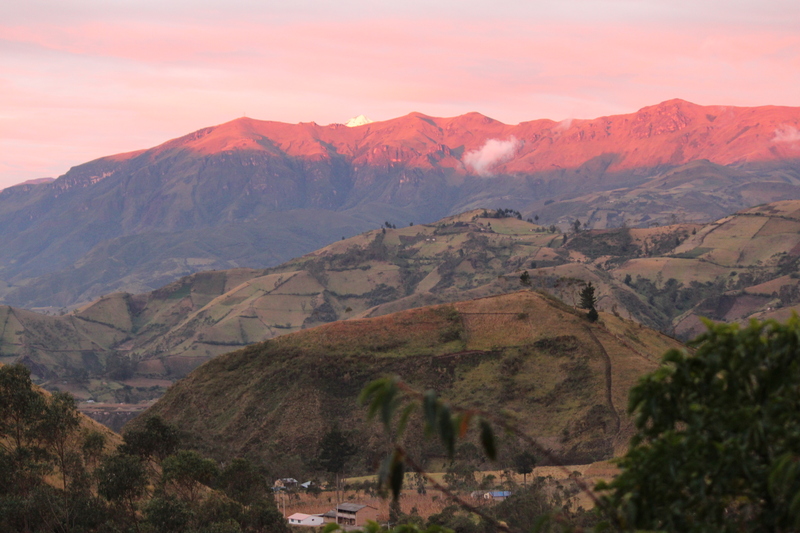 This stunning sight inspired the Quilotoa Loop— a trek in the sierras of southern Ecuador that takes you winding through Kichwa villages and around the crater we found ourselves prepared to hike. With just two nights available for our excursion, my friend Josh and I decided to bus through the windy roads directly to Quilotoa. From there, we intended to hike around the crater, drop down into a valley quilted with farms, and work our way back up to a neighboring town, Chugchilan. In Chugchilan, we had reservations at an eco-lodge we were eager to see (spoiler alert: we made it to the Black Sheep Inn and I highly recommend it for those of you ever near the area). The smell of moist soil. The crisp wind chilling your face. The pounding of your heart with every breath as your body acclimates to the thin mountain air. The exhilaration of the promise of adventure to follow. While a recent post celebrated the tranquility of the seaside, a close second for me is the allure of the mountains. Nothing inspires more awe than being surrounded by towering vistas. As I gaze out, I feel small. Yet, as I summit peaks and tiptoe along narrow ridges, I feel increasingly capable. Engulfed by the wisdom of our earth-ancestors, I feel Whole. Perhaps that is what is most intoxicating about the mountains, the proximity to grandeur. It is here that brings me back to the joy of childhood camping trips. Here that reminds me of my inauguration into environmentalism and earth-based spirituality. Here that makes me wonder at the universe in its deep mysteries. Here that returns me to the pursuit of Self as she emerges today. While this is how the blog post began, my tone changed as the day went on. (1): If you want to circumnavigate the crater, you should forgo a morning hike down to the lake’s edge so to beat the rain, certain to come as afternoon approaches. (2): For both your timeframe given the above-mentioned rain and your legs and lungs unless you are superhuman (or perhaps just more than moderately fit, as I am today), I recommend choosing either walking along one-third of the crater and onwards to Chugchilan or the two-thirds route (a significantly steeper climb) with a night’s rest in Guayama, the town at the base of the crater’s backside. (3): Especially for those adventurers who will neglect to heed advice numbers one and two, gear is of the utmost importance. And what I mean by this is proper footwear for a slick mud trail atop a mountain peak and a nice rain jacket— for goodness sake why did I leave it in my pack? Just ten minutes into the hike, the rain began. Gentle and scattered, our more immediate concern was the impending fog threatening to obscure the promised view from the summit. Sure enough, by the time we reached the highest point on the crater’s rim, we were not actually sure that we were at the highest point. Swallowed by the clouds, we walked slowly seeing only a few feet in front of us. I was consistently reminded of how high we were as the pounding in my heart— once poetic, now dihabilitating— rapidly increased. Knees aching and calves screaming, I fought for every step with the dim realization that we were just two hours into what was assumed to be a six-hour journey. And that guesstimate was for the “fit hiker”; with how unfit I felt in the moment, I silently wondered if it might be closer to eight. Pulling my body up the mountain, I tried to push that fear aside. Finally, a glorious moment of reprieve came as we descended from the peak. With what seemed like a single gush of wind, the weather cleared. Left with just a whisper of mist, we could once again see the magnificent lake below and the rolling hills behind us. Naively, we cheered our good fortune. Minutes later, just as suddenly as the fog had lifted, we were in a complete downpour. Water spewed from the sky, soaking the mudded trail and fields around us. Quickly, my lightweight trail runners became personal swamps as my socks absorbed everything my feet sank into. The squish squish sound of my then waterlogged shoes became a mockery of our naivete, its constant jingle a reminder of my dwindling optimism. As Josh sloshed on in front of me, I focused on my breath, hoping to increase the oxygen to my body and distract myself from the mounting sense of doom. We were going off instructions that felt a bit flimsy given the weather conditions: walk two-thirds around the crater (how could we tell our distance from the start when we could not see the rim nor the lake below? ); on the third sand dune (with every sandy spot, we wondered if this would constitute a “dune”), drop into the valley heading northeast (with no visibility, where did the sun rise from again?). We held out on those sand dunes until we came to a stretch I would never have named such. The hiking gods (i.e. backpackers before us) were kind. Right in the middle of our path was a giant arrow made of pebbles that pointed away from the crater and down the mountain. Where to go, though, was the least of our concerns as our clothing and path became wetter and slicker with every passing moment. Hesitantly, I side-stepped down the path, slipping and sliding along the way. Frequently, I landed directly on my bum— mud and tears mixing with the rain that steadily poured down my face. Tired, hungry, cold, and soaking, we somehow made it to the base. Once there, we came upon an inn (one we suspect is strategically located for the specific predicament in which we found ourselves). “Queiren dormitorio?” the farmer inquired. Josh and I silently conferred with our eyes. Looking out, we could see the long walk we still had before us. The valley stretched in front of us winding through pastures and farm houses. At the other side was the most dreaded point, an upwards turn of the path that demanded yet another climb. But the promise of a slow-cooked vegetarian meal and the highest disc golf course in the world pulled us onward. It was decided: we would stick to our plan to end the night at Black Sheep. Not thirty minutes later, we were seriously questioning our thinking. We had not encountered anyone since the innkeeper behind us and one honking bus who sped by sending a puddle screaming our way. I had a nagging fear about the fate of the electronics in my pack. Gushes of wind blowed through the ravine and made the cold all the more unbearable, and the thought of four hours more nearly intolerable. Grumpiness settled upon both Josh and I. With the fog and the rain and the many falls, we had remained good-humored. Laughing when we could. Remembering what a gift it is to be on such an adventure. Celebrating our physical capacities. Occasionally mustering a song to hum, soothing ourselves amidst the struggle. Somewhere along the lonely path to Guayama, though, our good-natured smiles wore thin. Admitting defeat took twenty minutes more. When we arrived at the deserted town of Guayama which had only a lonely bus station and two homes that the owners converted into shops, we knew we needed a new plan. Huddling beneath the over-hang at our new friend’s tienda, we stripped our wettest layers while searching for dryer clothes in our packs (there were none). The shop-owner hurriedly made tea, promising that the mountain herb and hot water would warm our bodies. Shivering, we accepted his hospitality with borderline desperation. We then borrowed his phone to call the lodge. For forty dollars, a truck could come pick us up. The high fare for travel in Ecuador, forty-five minute wait, and hour drive seemed like a small price to pay in exchange for forgoing another mountain climb. When the truck arrived and we discovered that we’d be in the back of the pick-up driving at high speeds on the road above, it seemed less clear. Nonetheless, we piled in and huddled close. As we made our way up the mountainside we’d laboredly walked down just hours earlier, the rain finally lifted. Evening approached and the sun painted the sky hues of pink. Tucked beneath our rain jackets, still shivering from the cold, I looked out and saw a view that made the whole day worth it. Beyond the valley we’d just emerged from, the clouds parted near a ridge with Cotopaxi towering behind it. The white of the snowcapped volcano accentuated the pink sky all around. Smiling at the view, Josh and I shared a sigh. Rejoicing in the splendor of the vistas, I thought that a post might be warranted after all. That’s the thing about climbing mountains. You start off strong, bounding with energy. It gets hard in the middle. But its always worth it at the end. Yes! testing and swinging and all the rest. Wouldn’t trade ’em for anything.